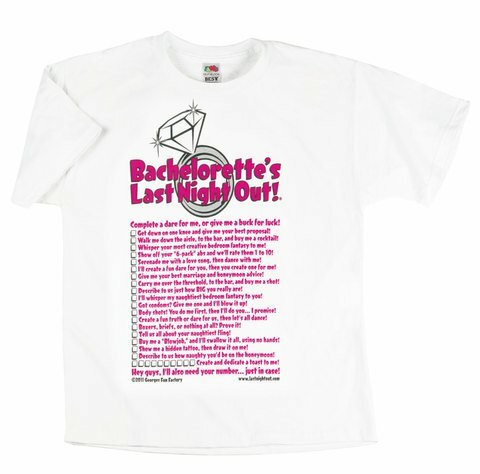 Bachelorette’s Last Night Out Bachelorette Scavenger Hunt T-Shirt with Pen. Last Night Out Scavenger Hunt T-Shirt and Pen from George’s Funfactory! 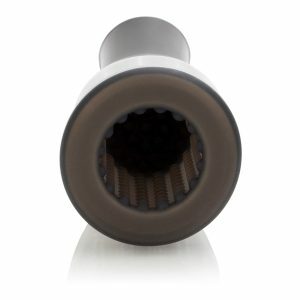 Best-selling product improved! New graphics, but more importantly, new and updated, fun dares! Includes marking pen to sign off on all the dares! Have the Bachelorette wear this shirt on her Last Night Out! Make sure she completes all the dares before the end of the night, but do not let her groom-to-be see it completed or the wedding may be called off! Includes a Bachelorette Last Night Out! marker to check off all the completed dares. Wow! 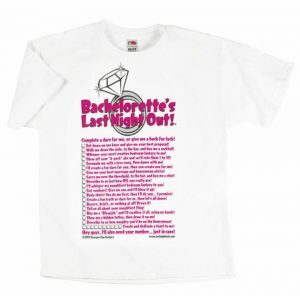 This bachelorette shirt is extremely cute! Definitely not for the shy Bachelorette, unless, of course, you want to put her through torture but then again, it is her last night out! She better not let the groom see it completed or the wedding is off! Includes marking pen to collect signature of attendees at the party. One size up to ladies small to large. White tee shirt with a crew neck, short sleeve comes with black lettering. 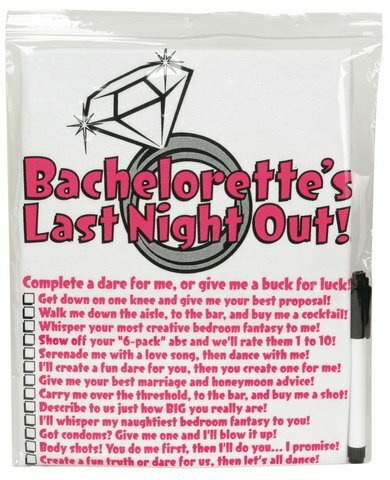 Category: Bachelorette Party Supplies, Bachelorette Gifts, Bachelor Party. George’s Fun Factory: Manufacturing fun! Please note the package has changed on this product. New images added April 29, 2013.